Lottie’s Gothic Rose Festival is here. 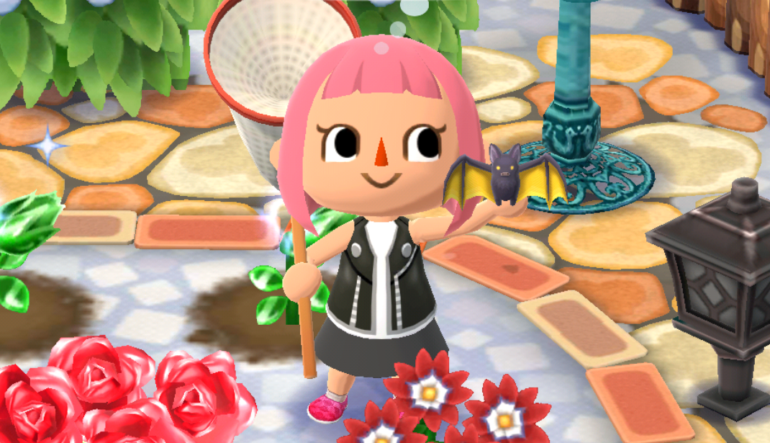 Bats have been added to Pocket Camp as part of the Lottie’s Gothic Rose Festival event, which began on Feb. 1 and runs through Feb. 10. Players are asked to collect bats and hand them over to esteemed bat collector Lottie to earn limited time prizes. Gothic bats and golden gothic bats are available now in Pocket Camp, with ruby gothic bats and diamond gothic bats coming on Feb. 6. Two types of flowers are available, too: gothic purple roses and gothic red roses. Regular gothic bats are attracted to purple roses, while golden gothic bats are attracted to red roses. When gothic fusion roses become available, the ruby and diamond bats will flock to them. Planting each type of flower will bring bats to your garden, but they’re one-time use to attract bats. Like with butterflies in Rover’s Garden Safari, there are three options: just go at them with your net individually, collect them all at once, or ask Lloid to do it for you. Clicking a plant will pull up a menu that gives these options. Capture and Capture All are chance-based instead of timing-based like with regular butterflies in Pocket Camp. Catch rates for Lottie’s Gothic Rose Festival are higher than they were in Rover’s Garden Safari, but Capture All still seems more reliable. To ensure you capture all the bats, you can ask Lloid to do it for you. He’ll catch all the bats, but it’ll cost 10 Leaf Tickets. If you’ve got a lot of bats in the garden, it’s worth it to shell out the Leaf Tickets if you have them. But Capture All isn’t a bad option now, either, especially with the higher capture rate. Friends can also leave bats in your garden, even on plants that aren’t roses, so it’s a good idea to keep your garden stocked with plants, even if you’ve caught bats from certain plants.